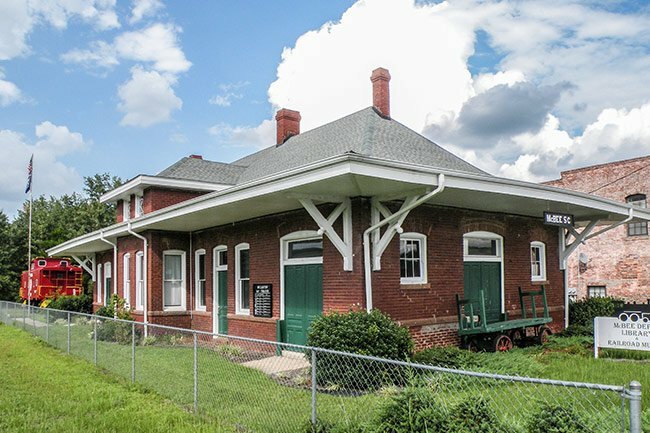 The Seaboard Air Line Railway Depot in McBee was built in 1914 and is the second depot constructed for this railroad line. McBee was a stop along Seaboard’s 91-mile route between Columbia and Cheraw, which was in turn part of Seaboard’s main route between Richmond and Tampa. Amazingly, given its age, the building has not undergone any major renovations since it was built. 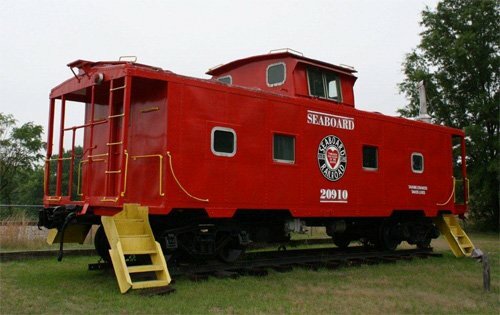 When Seaboard stopped its passenger line in the 1960s, the depot stood vacant for 20 years. The depot closed for all services in 1971. 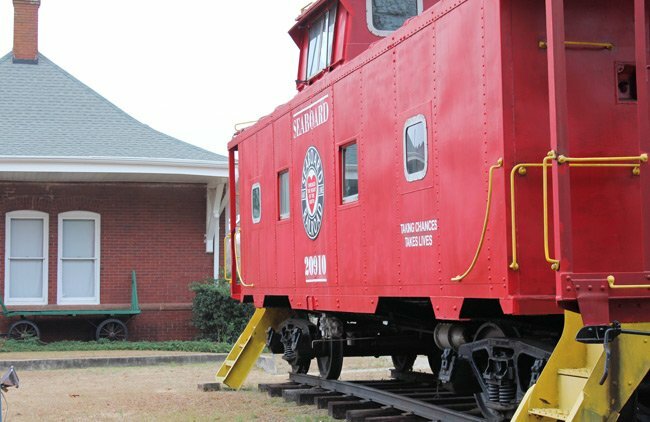 Eventually, it was purchased by the Town of McBee and converted into the McBee Library and Railroad Museum. 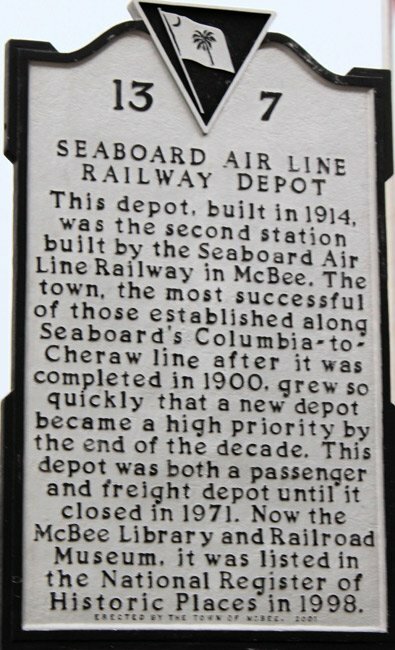 The Seaboard Air Line Railway Depot, built in 1914, was the keystone of McBee, the most successful of several towns that arose along the Seaboard line between Columbia and Cheraw soon after its completion in 1900. It is thus locally significant for the prominent role it played in the town’s early history and commercial development, and as a tangible reminder of that period. The building retains its historic architectural integrity and has undergone no significant alterations since its construction. 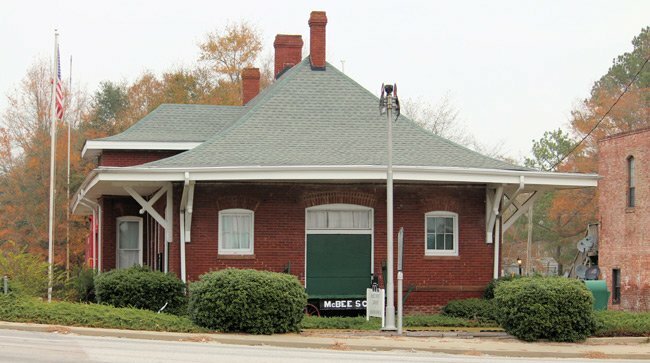 The depot is a one-story red brick building located within the town’s central commercial district and was built on a modified rectangular plan. Its wooden window frames and trimwork are painted white; each of its doors is a deep forest green. Three brick chimneys protrude from the peak of the sharply pitched hipped roof, which is covered with pale green asphalt shingles. A single dormer with two casement windows projects from the roof on the west façade. 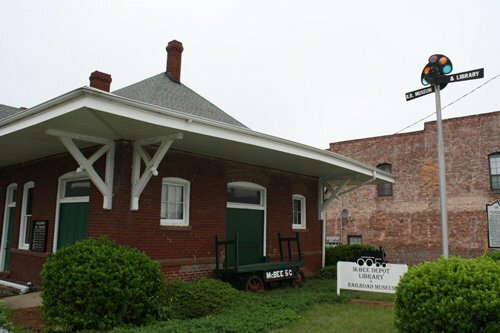 After Seaboard discontinued passenger service in the 1960s, the McBee depot stood unused until the 1980s when the building was restored to its original condition for use as the McBee Library and Railroad Museum.